“Other Woman” presents the most emotionally devastating scene Charmed has ever taken on. When it becomes clear that Niko has been targeted by a shapeshifter—a demonic super-assassin who will stop at nothing once it has a target—Mel makes a huge decision. She seeks out a spell to erase Niko from her life, altering history so that the two of them have never met. The way she sees it, she’s going to lose Niko either way. At least this way, Niko gets to live. It’s a wildly intense choice, and it gets shoved into the episode’s final act. On the one hand, that sense of sudden, uncontrollable urgency conveys exactly how Mel must feel. It doesn’t seem like she can stop the shapeshifter from its deadly errand, and it doesn’t seem like she can stop Niko from obsessing over Trip’s death. She becomes quickly convinced that she needs to do something and do it right now. It’s impulsive, but Mel has proven to be the more impulsive sister, especially when it comes to using magic to right wrongs, so it tracks. Unfortunately, the rushed pacing also chokes the storyline a bit, undercutting its efficacy. 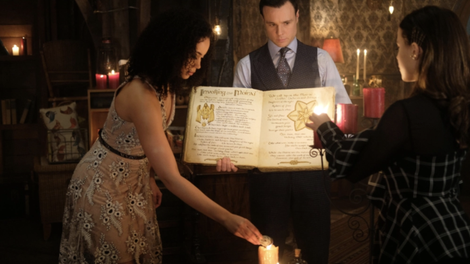 The images of memories of Niko and Mel swirling around them as the spell takes hold propel the scene into corny territory. Melonie Diaz’s performance sells it for the most part, but there’s still a sense that Charmed over-relies on cheap pandering tricks to ramp up the stakes when it doesn’t really need that at all. Mel and Niko’s relationship has been so well written since the very first episode, and the weight of this decision is clear from the moment Mel first suggests it. The fact that Niko and Mel have been such a bright spot in this show’s character and relationship development is also what makes this tough to swallow though. First of all, Mel seems weirdly at ease at the end of the episode. Yes, she says she isn’t sure how she can ever get over it, but she’s oddly functional for someone who just erased her girlfriend from her life. It could be denial. Or it could just be that the episode doesn’t have time to actually get to the emotional ripple effects of the decision because the decision comes so late in the game, instead choosing to focus on the plot-based ripple effects. This is essentially like a very bad breakup but even more intense, and Charmed doesn’t quite leave enough room for the full weight of it to hit, instead relying on the over-the-top stylization of that farewell scene to do all the work. And on top of that, it’s a bummer that Charmed sacrifices its one queer relationship for the sake of plot. Mel and Niko’s relationship has been compelling and nuanced, and stable queer relationships where two people just get to be happy and themselves are still so rare on television. Mel’s struggle with whether to tell Niko about being a witch provided gripping and surprisingly grounded tension without threatening the relationship altogether, but that drama hardly matters now. It’s great that the most established and complex relationship on the show so far has been a queer relationship, but that comes with the burden of having to provide the show’s biggest relationship conflict. All that said, Charmed has taken some big swings these past two weeks—first by killing Trip and now with Niko and Mel. The negative side effects of being witches are becoming more and more severe. The sisters’ actions are starting to have truly life-or-death consequences, and that raises the stakes significantly. Niko has become another casualty of the magical doom that has befallen Helltown, and even though Mel technically finds a way to save her, she does so at great cost to them both. It reiterates how much she loves her, making it all the more powerful. Charmed should make these kinds of bold story choices if it wants to transcend simply being a Monster Of The Week supernatural series. But it needs to have follow through, too. Otherwise it comes off as hollow shock value. Because of how intense the Mel/Niko storyline is, the rest of the episode feels a bit phoned in. Macy becomes convinced that Galvin’s new hot-and-heavy romance with a woman who seems too perfect to be true is magically influenced. She and Maggie go so far as to assume Summer is a succubus and awkwardly attempt to vanquish her. The twist that she is just a normal human woman and that Macy was letting her feelings of rejection influence her perception isn’t really a twist at all. It’s painfully obvious, and in this case, Charmed doesn’t really add enough to the story to make it feel like anything other than a paint-by-the numbers plotline. It doesn’t help that the writing of Macy and Galvin’s back-and-forth dynamic hasn’t been the strongest or most consistent. The thematic throughline in “Other Women” concerns the sisters’ romantic relationships, and when it comes to Maggie, this means confronting the fact that she kissed Lucy’s boyfriend Parker. Maggie maturely admits to herself that she didn’t just kiss him because she was trying to distract him from the exorcism; she did want to kiss him on some level. She finally comes clean to Lucy in the end, but only after playing along when Lucy enlisted her to help her find out if Parker has been cheating on her. Maggie claims that she didn’t tell Lucy sooner because she didn’t want to hurt her, and Lucy rightfully doesn’t accept that. For being someone whose literal power is empathy, Maggie fails to see how lying only hurts Lucy more and serves her own interests. 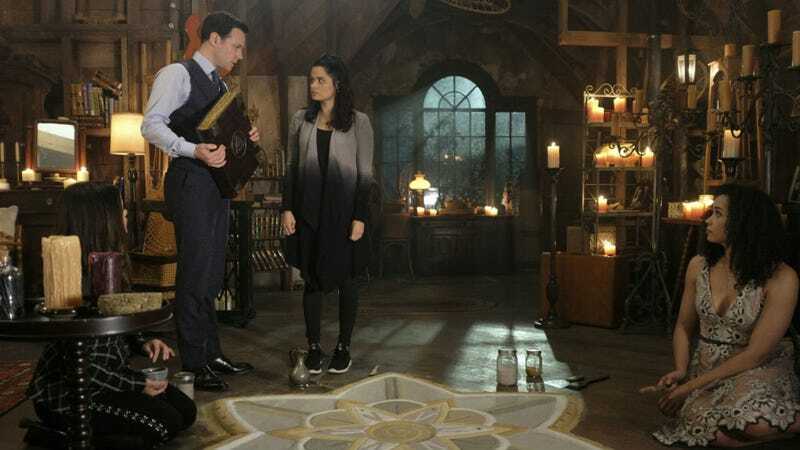 That disconnect is intriguing, but again, Charmed doesn’t quite have the time to unravel what it really means, leaving yet another big emotional moment for the end of the episode (albeit one that still in no way compares to what Mel is going through). “Other Women” has some very strong emotional storytelling going on, but its held back by uneven pacing. Relationship dynamics are an area where the show thrives, and an episode so rooted in relationships is a smart move, one that gets at the heart of the show. But the rushed, slightly mechanical execution dulls its potency, and now the show is without what was easily the strongest, most captivating relationship outside of the bond between the sisters. I’m not convinced Niko and Mel are done for good. The door is technically left open for a reversal, because Harry says there’s no way to undo the spell that he knows of. I have a feeling an alternative option will pop up somewhere down the road. That said, I hope Charmed does actually delve into the emotional ripple effects of Mel’s decision in the coming episodes. Maggie’s alias is Mariah Aguilera. Mel offers Niko homemade asopao and pinot grigio after a hard day, further cementing her as a very good girlfriend!!!! There’s a new villain in town, and he runs a biotech company, naturally. We learn that Harry remembers nothing of his life prior to becoming a Whitelighter.